A number of upscale brands are taking their concierge services digital, using texting, social media, and custom apps to help guests connect with the hotel. In some cases, they’re replacing people with technology altogether. It’s quite a change for this very traditional hotel role. And while it may dismay travelers who rely on concierges for assistance and advice, there are definite upsides for guests. Many of the new apps provide a central place to make various kinds of requests. At Conrad Hotels & Resorts, for instance, you can book a spa treatment and ask for restaurant recommendations with a few taps instead of multiple phone calls. You can even select your room and order a room-service meal before check-in, tasks that were challenging—if not impossible—at the hotel previously. Useful for those times when you’re away from the hotel but want a concierge’s local insights, Porter & Sail is a city-guide app used at independent hotels. It offers picks curated by distinguished locals (musician Moby, chef Alan Stewart), and is available at more than three dozen properties worldwide, including Soho Beach House, in Miami, and London’s Zetter hotels. Social-media addicts might appreciate that Hyatt has taken to Twitter—direct-message or tweet at the @HyattConcierge handle, and the 24/7 guest-service team will usually respond within 15 minutes. (It’s handy for quick requests, like extra pillows or a restaurant suggestion.) Guests of most Commune Hotels & Resorts don’t have to speak to anyone in person, either—they can use e-mail or SMS to communicate with the hotel, whether they want to inquire about a car service or complain about noise. And a new function in the Marriott Rewards app lets guests chat with a concierge before they arrive at the hotel. Like the world’s best concierges, some of these apps are fluent in multiple languages. Though Connie, the two-foot-tall robot concierge unveiled in March at the Hilton McLean Tysons Corner, in Virginia, is monolingual, the AI-powered automaton is able to answer simple, common requests (What time does breakfast start? ), so guests don’t have to wait for attention. Some hotels are adding vague, even questionable charges—like facility and hospitality fees—to bills. Several in Canada are being sued for making a marketing fee look like a tax. If you don’t know what a charge is for, ask. If it’s not an actual tax and you weren’t informed about it, politely request its removal. With architectural pedigrees, fitness classes, and (believe it or not) good food, you might actually want to stay at one—even if you don’t have to. The Westin Denver International Airport, shaped like a whale’s tail rising above the main terminal, debuted in December. Travelers can recharge in Westin’s Heavenly beds, swim in the 11th-floor pool, soak in a hot tub with Rocky Mountain views, or take advantage of yoga classes and self-guided art tours. Dutch architecture firm Mecanoo was tapped to create the Hilton Amsterdam Airport Schiphol. The striking, modern building, wrapped in diamond-shaped windows, has 433 chic guest rooms decorated with Dutch art and furnishings, 23 meeting spaces, and a spa with four treatment rooms. With floor-to-ceiling double-glazed windows and comfy lounge chairs, the 229 rooms at the new five-star Pullman Sydney Airport Hotel feel like stylish apartments. The fitness center is open 24 hours, and the restaurant, Mobius, features an open kitchen and a mix of individual and communal seating. Hilton wants you to “stop clicking around.” Marriott says, “It pays to book direct.” Hyatt tells travelers they can save big. Hotel companies are tired of paying commissions to online travel agencies (OTAs) like Priceline and Expedia, so they’re trying to convince customers to cut out the middlemen—they promise you’ll find the best prices on their own websites and apps, with loyalty-program members seeing even bigger savings. But do they deliver? We put the brands to the test, to see what kinds of discounts travelers could expect, and got mixed results. In some cases, prices were lower on hotel websites. In others, the very same room cost 20 percent more. So caveat emptor—but remember that if you’re trying to collect hotel loyalty points, which you don’t get through OTAs, it might be worth paying a little bit more. Hotel-branded cards are gaining on their airline competitors, offering customers these valuable extras. Cards have been giving record sign-up bonuses this year: the Hilton HHonors Surpass American Express and the Chase Marriott Rewards Premier Business cards each offered 100,000 points for meeting the initial spending requirement, enough for a night at a top hotel. Several hotel cards do better than the usual one mile per dollar spent. The IHG Rewards Club Select card, for instance, pays double points on gas, groceries, and dining. While airline cards come with benefits like free checked bags and priority boarding, many hotel cards now simply bestow full elite status. The Hilton HHonors Citi Reserve and American Express Surpass cards make you a Gold guest—with 25 percent bonus points on hotel stays, free Wi-Fi, late checkout, and more. IHG cardholders get a free night every year at any of the brand’s properties, even the pricey InterContinental Paris-Le Grand (from $549 per night). The Hyatt Visa’s complimentary stay is only good for hotels in specific categories, but that includes some luxury resorts. If you consider them at all, you might think of extended-stay hotels (a.k.a. apartment hotels) as functional but blah accommodations for businesspeople or families between homes. But a number of properties aimed at leisure travelers have recently hit the market. They’re upscale, offering rooms that feel like residences (kitchens, separate bedrooms), yet with a level of predictability and service that you generally don’t get with vacation rentals. There’s just one element travelers might miss. “Some people want to meet the owners and have some hot chocolate with them,” says Skyler Reep, marketing director at Stay Alfred, which has serviced apartments in 11 U.S. cities. “We don’t offer that.” For some, that might actually be a selling point. This property in the Financial District offers loftlike digs starting at 500 square feet, done up in a minimalist style. Pets are welcome, and guests get access to a 21,000- square-foot La Palestra fitness center. Have groceries delivered to your suite or, starting next year, just head upstairs to the April Bloomfield and Ken Friedman restaurant. Roost’s two locations— in Midtown and Rittenhouse Square—have Midcentury Modern furnishings and bathrooms clad in subway tile. Each unit (from studios to two-bedrooms) is equipped with a Bosch washer and dryer, Apple TV, and Sferra sheets. With the in-house bike-share program, guests don’t even need to bother with Uber. Poised to become a celebrity favorite, the just-opened Proper offers one- and two-bedroom suites kitted out by Kelly Wearstler. All units have professional-grade kitchens, and two of the four penthouses come with private plunge pools. Guests can avail themselves of the rooftop pool, open-air yoga patio, and coffee and wine bar. Vacation-rental specialist Paris Perfect spent two years renovating this 17th-century building. Situated on the Île de la Cité, it contains six apartments decorated with gilt-framed mirrors and contemporary sofas. The kitchens are sleek. 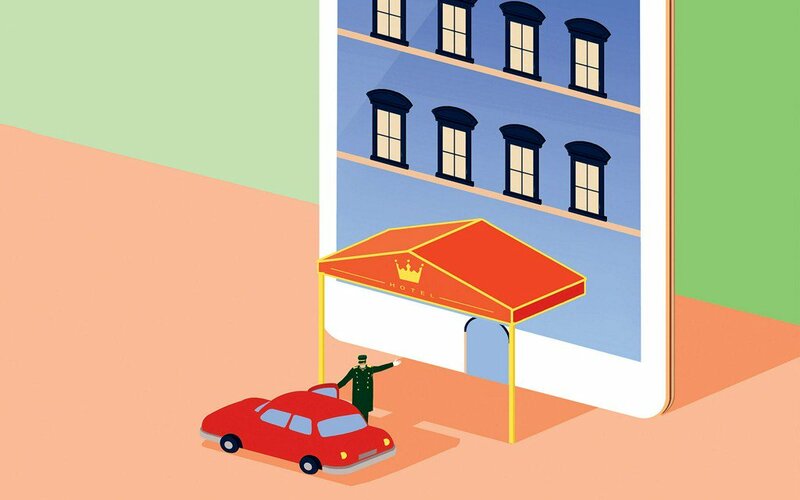 While there’s no concierge in residence, the company will make your restaurant reservations for a small fee. This app (Android, iOS) and website lets guests reserve rooms in four- to nine-hour blocks—typically between 10 a.m. and 4 p.m. Inventory consists of three- to five-star hotels, mostly in U.S. and Canadian cities. Five daytime hours in a deluxe double at Tryp by Wyndham in New York costs $125, versus $249 for a regular stay. Recharge (iOS) makes upscale hotel rooms— at press time, four- and five-star properties in the Bay Area— available at the last minute, for 66 cents a minute (around $40 an hour). By comparison, a same-day booking made directly with Park Central Hotel in San Francisco, one of the properties on the app, is $284 a night. The only global microbooking service, Dayuse (Web, Android, iOS) has an inventory of more than 2,000 hotels in 15 countries. You’ll find plenty of Quality Inns and Best Westerns, but also a few gems. Sort hotels (by cost, proximity to airport, etc.) to find spots like the Pullman Miami, just three miles from the airport.